It was 150 years ago that a group of fit young men (really?) advertised in a Local; Newspaper and proceeded to found Bideford Cricket Club. Very few of the senior members can remember that! To mark this wonderful achievement the MCC had granted us the privilege of a match against an MCC team. The day was absolutely gorgeous probably the hottest day I can ever remember on the Ho! - and one of the few days, if not the only one ever – I have had to have the door of the score box open to keep cool (obviously I normally keep shut to keep out cricketers and the like). MCC won the toss and batted – at least MCC batted. They had a large 2nd wicket stand of 116 after which wickets feel pretty regularly and a total of 200 was put on the board for 9 declared. 2 Oxfordians David (Superman) Staddon and Marten Stanbury turned out to help the MCC adding a further feather to their respective caps. In general the damage on the MCC was done by Jack Ford who bowled 13 overs and took 4-34 while Martin Stewart took 2-35 off 11. In reply James Ford – having managed this time not to be run out first ball – looked good for his 17, Tom Brend for his 24. Jayson also got 24 Oliver Hannam 16 and John Weeks coming in for a late replacement for Fred King who had eaten or drunk something tainted apparently hit a mighty 6. The best Bide could post was 136. However it was a day of more gentle cricket – when players were keen to win enjoyment was top of the bill and everyone did enjoy themselves, feasting not only on the cricket, but on the superb food provided all Saturday and Monday by a host of helpers all of whom (and those throughout the season) really do have to thanked for making Monday so very special, and the cricket at the Ho! In general so enjoyable – the only problem I will have to go on another diet before the 2018 tea- I mean – cricket season starts again. Monday was a day of nostalgia and enjoyment and I hope all those who attended in any capacity did. On a personal note I have been trying to tot up my scoring days at the Ho! And reckon I have just passed 350. Not bad for an old man. By the time the next 150 years come, I will have notched up quite a few more games. As part of our 150th Anniversary Celebrations since Bideford CC was formed by 'young men principally engaged in houses of business in the town', the club is hosting a match on August Bank Holiday Monday, the 28th, against a representative MCC side. Play will begin at 11.30. All members, and non-members, are welcome to come along to watch and join in what promises to be a wonderful celebration and day's cricket. The bar will be open all day, and sunshine is (not) guaranteed!!! 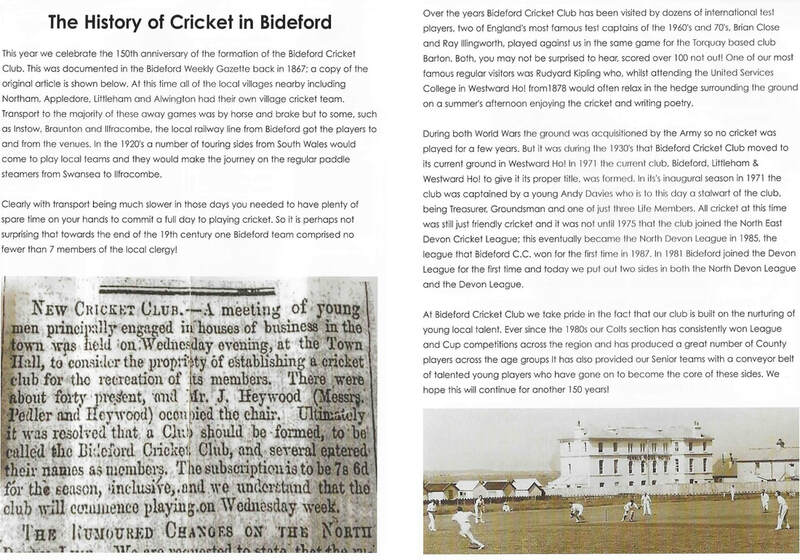 For more information on the history of our club, read on below or download a pdf here.